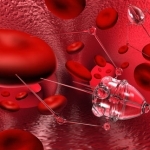 A prototype nanobots is currently being developed that could one day detect disease in humans. These tiny robots are being developed to mimick living creatures. According to the article, the minute devices are called “Cyberplasm” and will be able to join together advanced microelectronics with cutting edge biomimicry (technology inspired by nature) research.